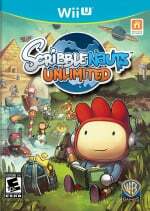 Scribblenauts Unlimited was a Wii U launch title, but has been MIA in Europe for the majority of 2013. Thankfully, during today's Nintendo Direct it was confirmed that the game is finally seeing the light of day — more than a year after it appeared in North America. Euro players will be able to get their hands on 5th Cell's innovative title on December 6th. The 3DS version is also being released on the same day. With Scribblenauts Unmasked just around the corner, it's hard to get excited about a year-old game, but will you be picking this up regardless? Drop a comment to tell us. Anyone know the cause of the delay? Can't say my excitement for this from a year ago is still here. Too many good games coming out for me to care much right about now. Maybe in the future when it's cheaper. The amazing part? Australia somehow got it back in November, 2012. Brb, gonna go play it. Let your blood boil. Muahahaha. I think they totally missed the boat. Six months ago, it could have sold satisfying numbers. In December, this game will sell miserably, there are a lot of heavy-weights from Nintendo coming. @SideScreamer Well at least Australia got something first for once. Of course it all makes sense now! I was really confused during the direct thinking "Wait haven't I seen this in shops before?" Wonder how it got a year delay when a PAL release already existed. I had already given up on this one, better late then never indeed! It's still on my list of games to buy. Such a delay !! The sales for this will be very bad due to this delay, their only hope is parents picking it up for kids in the xmas rush. Personally i just went with the steam version in the last 75% off sale, i'll be doing the same for Unmasked since the Wii U version is fully priced and not out yet while the PC version is £15 at GMG and available now. Really thinking whether I should even get this game anymore now. ...ah heck, of course I will. It's got Yoshi, damnit. The Wii U version anyway. Better late than never, but too late is still too late. Not even a "sorry for the wait"-sale or something? It's been on sale for like $5 on Steam twice already. Nope. I'm with @taffy: I was interested last year. I got this for ~£5 in the Steam sale and it'll likely be even cheaper in the winter sale. How on Earth can Nintendo even justify this at this point? It's awful practice. There were no problems with the game from those who were lucky enough to snag an EU eShop download, and if they're not going to come clean and tell us why then I'm just not interested. Screw them. I was interested a year ago, I'm not interested now. This wasn´t released in Europe already? I didn´t even notice. Sometimes too late is too late. I'll be interested if it's cheap. I would have gotten it for the Wii U if there was no delay. I got sick of waiting that I got the PC version cheap in a steam sale. I don't think I have ever seen this amount of negative comments on an article. I'll be curious if the company offer some sort of explanation or apology. This was a launch window must-buy for my WiiU, might get it if Unmasked is delayed by a year (I hope not!). Still no explanation why it was pulled in EU the day before release though. PR guys/gals need to be sacked over their failure to tell us what happened. You know what's going to happen....they'll finally release it properly here in Europe, nobody will buy it and then they'll use the poor sales as an excuse not to release Unmasked in Europe. Almost feels like we're being trolled now. Final Fantasy X/X-2! Cuphead! My Time at Portia!